"Ganbara Knight" and "Blade Knight" in the state of Xyz Materials for "Number 39: Utopia". Xyz Materials (pronounced ik-seez) (Japanese: Ｘ（エクシーズ）素（そ）材（ざい） Ekushīzu Sozai, エクシーズ素（そ）材（ざい） in card text before Duelist Alliance), are cards stacked underneath an Xyz Monster. They are known as Overlay Units (オーバーレイ・ユニット, Ōbārei Yunitto), abbreviated ORU, in the anime and manga. When an Xyz Monster is Xyz Summoned, the monsters used for the Xyz Summon are stacked underneath the Summoned Xyz Monster. The attached Xyz Materials do not occupy a Zone. Many Xyz Monsters have effects that require detaching Xyz Materials (sending an Xyz Material attached to that Xyz Monster to the Graveyard) as an activation cost. If the Xyz Monster is no longer in a Monster Zone, any Xyz Materials that were attached to that Xyz Monster are sent to the Graveyard. Some card effects allow attaching cards to Xyz Monsters as Xyz Materials (placing them underneath the Xyz Monster) through means other than Xyz Summon. Some card effects allow cards to be attached as Xyz Materials (such as "Xyz Reborn", "Overlay Regen" and "Number 101: Silent Honor ARK"). Unlike the terms Fusion Material Monster and Synchro Material Monster, the term "Xyz Material Monster" was never used. In addition, since July 2017, most instances of effects unambigously referring to Xyz Materials now simply say "material". Xyz Materials underneath Xyz Monsters do not count as monsters, so detached Xyz Materials will be sent to the Graveyard even if "Dimensional Fissure" is on the field. While monsters are acting as Xyz Materials, they cannot be targeted nor apply their effects. Xyz Materials are not treated as being on the field, and also being attached as an Xyz Material is not considered to be the card leaving the field. Therefore, when an Xyz Material is attached or detached, any effects of the Xyz Material that only activate when it leaves the field (such as "Reborn Tengu") do not activate. Token Monsters cannot be used as Xyz Materials, because Xyz Materials are attached to the Xyz Monster and attached Xyz Materials are not considered to be on the field. Even when attaching Xyz Materials with a card effect, Xyz Materials can only be attached to Xyz Monsters (e.g. "Phantom of Chaos" that has copied the effect of "Number C101: Silent Honor DARK" cannot activate the effect to attach a card as an Xyz Material). Likewise, even with a card effect, Token Monsters cannot be attached as Xyz Materials. Before it was clarified that Xyz Materials cannot be on the field, as an interim ruling, the TCG ruled that they were on the field (whereas the OCG consistently ruled that they were not). 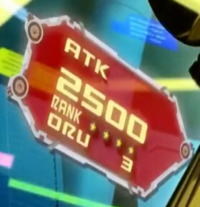 An ATK gauge from ZEXAL showing the number of Overlay Units. An ATK gauge from VRAINS showing the number of Overlay Units. In Yu-Gi-Oh! ZEXAL and Yu-Gi-Oh! ARC-V, as previously noted, Xyz Materials are instead called Overlay Units, and are depicted as orbs of light orbiting the body of the Xyz Monster, and glow with the color associated to the Xyz Monster's Attribute (e.g. LIGHT Xyz Monsters have yellow Overlay Units). Additionally, during an Xyz Summon, the cards to be used as Xyz Material light up with the color associated of their own Attribute before briefly spiraling around each other and entering a bright swirl of energy called Overlay Network. When the player detaches Xyz Materials for their respective Xyz Monster's effect, the monster in question is shown to absorb them through several methods, such being eaten with their mouth or striking a weapon they carry. In some cases, the Xyz Monster will glow with the Attribute color for a few moments before unleashing the effect. Uniquely, the Xyz Materials of "C" monsters of Barian origin are depicted as magenta crystals that float stationary in front of or behind the monster, often lined up to each other. These are named Chaos Overlay Units (abbreviated as "CORU"). When instead detached by another card's effect, the Units are drawn away from their orbit and dragged inside a purple Graveyard portal. In ARC-V, Xyz Materials are still usually absorbed by the Xyz Monster, but sometimes they are instead flung in another direction. A recurring example is the anime effect of "Raidraptor - Rise Falcon", which allows it to gain the total ATK of all opponent monsters that were Special Summoned; to symbolize this, the used Material is sent flying towards the field of the other player(s). However, in general these animated effects tend to be much less elaborate than in ZEXAL, often simply causing the Material to disintegrate while still in its orbital path. In Yu-Gi-Oh! VRAINS, Xyz Materials are more cybernetic, although, contray to how it appeared in ARC-V and ZEXAL, Xyz Materials in VRAINS are rather depicted rotating behind the monster in a form of "infinity" instead of orbitting the body of the Xyz Monster, also, the orbs are not colored by their respective Attributes. ↑ "Starter Deck: Dawn of the Xyz". Konami. ↑ "Important Rulebook Updates! "Xyz Materials" and "Leaves the Field"". Jerome McHale. ↑ "Adjudication Conflagration". Kevin Tewart.